What a surprise! I thought H is for Hawk was a novel. I don’t know what my brain was thinking … that it was a posthumous replacement of H is for Homicide by Sue Grafton? It was a shock to discover this is nonfiction, and it really IS about training a hawk, a goshawk. I would never have picked this book off the library shelf if I knew these salient points. What I DID know is numerous people recommended it to me. And so I read it. And I loved it. Helen Macdonald is a superb writer, I believe, to write about a hawk – a topic I had NO interest in – with such sensitivity, insight, suspense, humor, vulnerability, awareness, and knowledge! At one point she spends an entire page explaining different hawk hoods. Seriously? Whatever she didn’t know already, she researched very well. This tale of her training her goshawk parallels T.H. White’s 1951 nonfiction book, The Goshawk. A constant theme is to compare and contrast what White is doing with his goshawk, with Helen’s decisions in modern-day England about her own. Yes, that is the same T.H. White who wrote The Once and Future King and The Sword in the Stone. 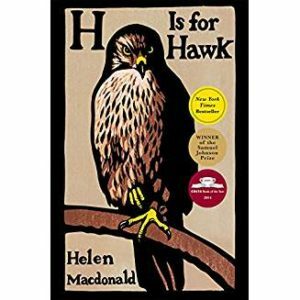 Helen’s father dies early in the book, and I realize that my friends recommended H is for Hawk because of how Macdonald interweaves her grief into the tale of her goshawk. Every 20 or 30 pages she talks about what is occurring with her grief, the memorial service, being with her mom, etc., and observes what she is learning and what parallels there are. It is a very non-sappy approach to grief, and I think one readers can understand readily. I am most profoundly impacted by a quote she shares from poet Marianne Moore: “The cure for loneliness is solitude.” Makes me think. I read this last year and think I recommended it to you. Wrote in my notes (I gave it 2 stars) that it was “an oddly compelling read”. What I liked best was Helen realizing how much Mabel was teaching her about life, human and animal, and how nature was helping her heal the loss of her father. The latter was one reason I recommended to you. Glad you enjoyed! Mary, I assume 2 stars is not a stellar rating on your part? What is your scale? What didn’t you care for? 2 stars indicates I really like the book!! My rating system isn’t very structured and I use it to draw my attention to books I especially enjoyed and might recommend. Most books gets no stars. I read it to the end, enjoyed it, but not super-excited about. Some get one star and others two. These are books I found to be engaging, well-written with a good story. And ones I want to share and talk about. Most books I don’t enjoy I don’t finish. I usually make a brief note about them in my reading log. The few books I don’t enjoy but manage to finish get a longer ramble with a downward arrow. H is for Hawk was a super book in my opinion. PBS Nature did a program on the author, her book, and the hawk. It was kinda boring, in my opinion. Thanks for explaining your rating system!